Although it is the #2 key coin of the "Big 3," there are not that many fake 1913-S Barber Quarters out there. Even the 1896-S has more. However, care should be taken when purchasing any 1913-S quarter, as recent substantial rises in value for this issue increases the likelihood that more fakes will eventually appear on the market. Starting in 1900, the mints switched to the same types of collars, resulting in identical edge reeding. Thus, you cannot tell the 1913-S from the coins of other mints by looking at the edge (like you can for 1896-S). 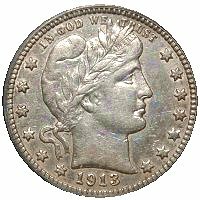 Beginning in 1909, the dates were hubbed, which meant that all dies for 1913 Barber Quarters, regardless of mint, had the exact same date position. 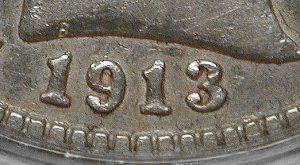 Thus, the 1913-S does not have unique date positions that are different from those of the other mints (like was the case in 1896 and 1901). Still, there are some other diagnostics that can be used to authenticate this coin. First of all, check the mintmark. It must exactly match one of the two positions shown. The first mintmark postion comprises the majority of 1913-S coins, representing perhaps 75% of the population. The reference here utilizes the terminology found in The Complete Guide to Barber Quarters, 2nd Edition, by David Lawrence, one of the true Barber series experts of all time. 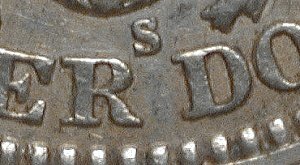 Reverse B: Mintmark is low and closer to R than D. This mintmark position appears much less often than that of Reverse A. 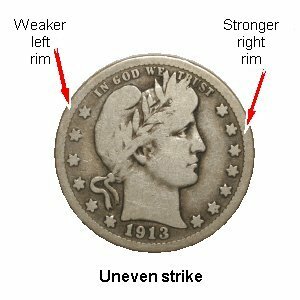 In addition to the mintmark, an important thing to look for is strike. The 1913-S Barber Quarter was unevenly struck, so that the left side was weaker on the obverse than the right side. As seen in the picture at right, the left rim is slightly shallower than the right rim. On low grade coins, it is common to find a full rim on the right side, but not on the left. This is not due to uneven wear, but rather the strike. Coins struck from both pairs of dies seem to experience this peculiarity. Although this characteristic can be seen more easily in lower grade coins, with close examination the unevenness can also be discerned on higher grade coins, including pieces at or near mint state. While every known 1913-S quarter has certainly not been examined for this trait, this writer has never seen a genuine coin without this unusual characteristic, and one should examine any evenly-struck 1913-S Barber Quarter very cautiously. If anyone has an evenly-struck 1913-S that is genuine, the BCCS (through this website) would like to hear of it. Mail to via the link at the bottom of the page. Thank you! 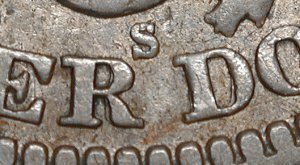 Die cracks: There are three different die cracks that might be seen on some 1913-S Barber Quarters, all on the obverse die associated with Reverse A. 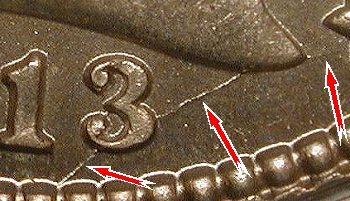 The earliest to appear is a short die crack in the lower part of the "3" in the date, connecting the ball to the middle (see picture right). In later die states, a separate crack begins at the rim, travels upward and right across the lower part of the 3, and then up and right to the bust. In latest die states, the crack continues right to the first star. A third die crack runs vertically just below the ear. 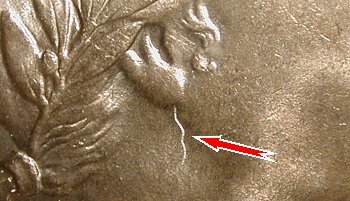 It is believed that the die crack under the ear began to appear before the second crack through the 3. The single best reference to Barber Quarters, is The Complete Guide to Barber Quarters, 2nd Edition, by David Lawrence (1992, DLRC Press, Virginia Beach VA). The above detailed information and photos Copyright � 2005 Barber Coin Collectors' Society -- all rights reserved worldwide. This page may be printed and distributed as long as Copyright notice is included.